Beautiful Sunday afternoon in Arlington today! Should have gone to see the cherry blossoms, since the wet weather earlier in the day drove off most of the tourists. I'm impressed that the unsigned Middle Distance Runner who played in Clarendon last night have been featured on altsounds, indieblips, and finefinemusic! Washington Post also reviewed previously. Middle Distance Runner headlined at Iota tonight and performed an awesome show. The band played a great set of new songs, the best being my favorite "The Unbeliever". Lead singer Stephen Kilroy's vocals were invigorating. Guitarist extraordinaire Allan Chappelear's energy level was so high it was almost dangerous, with him jumping around with the guitar cable snaked around his leg. Contrasting to him, bassist Tony Acampora looked cool and collected in his suit and tie. I was very impressed with the band's musical creativity. Allan Chappelear at one point was rubbing his guitar against the wall to create distortions. Keyboardist Jay Smith joined in the guitar play by strumming his Fender with a bow like a violin. Erik Dean kept the beat strong on drums despite his fatigue. He was obviously ill but still managed to stick it out for the duration. This is one tough band, as two years almost the entire troop came down with food poisoning and that did not stop them from touring! Middle Distance Runner and Eulogies tonight! 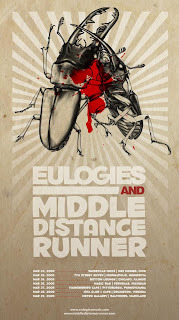 Looks like a fun lineup at Iota tonight with indie tunes by Middle Distance Runner and rock melodies via Eulogies. I really like the bass riffs in MDR's "The Unbeliever". There is a great claymation music video for this song too! Jay's Saloon is a tucked away local secret that is off Clarendon's main strip at 10th and Hudson Street. 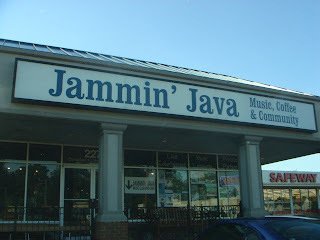 Its a great little dive bar with a very friendly staff and low priced offerings. I usually go for the crab cake sandwich, which is decent. I was able to take advantage of their happy hour beer specials today, which last from to 4 to 7pm weekdays. Check out Arlington Happy Hours for more after work specials! Also, the Cookography blog has a great article listing the best restaurants in the DC area. Tomorrow March 25 between 9:30 and noon, CBS Paramount pictures will be filming a TV scene on the Potomac River near the Key Bridge in which special effects (loud noise and fire) will simulate a small water vessel being blown up. This will be a heavily monitored and controlled event lasting only a few seconds. There is no cause for alarm. Today is the first day of spring and also the Persian New Year. Hope everyone was able to enjoy the pleasant clear skies today. Also, President Obama issued a video statement regarding Nowruz this week. His Farsi sounded perfect! 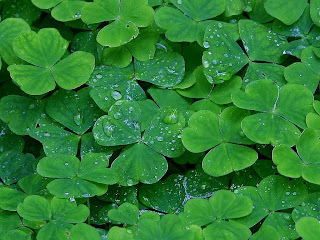 Also, local blogger Miles Grant gives us ways to find Real Green Beer, as in brew that is organic and not dyed with green food coloring. Another reason to frequent Lost Dog! Warm-ish weather and clear skies brought droves of party goers out to Clarendon on this Tuesday night. Both mainstay Irish bars in Clarendon, RiRa and O'Sullivans, had lines of people waiting to get in. Irish themed Mister Days ran out of green beer (Miller Lite + food coloring) around 8pm. Liberty didn't have a wait to get in, but the downstairs bar was packed and loud. Iota featured a lively celtic/folk/rock/punk band called O'Tasty's. Edit: Photo gallery of the party at RiRa online. (Washington, D.C.) The Metropolitan Police Department (MPD) has provided the following information regarding street closures and parking restrictions for the annual St. Patrick’s Day Parade and the St. Patrick’s Day 8K Race. Both events are scheduled to be held on Sunday, March 15, 2009. Street closures in some areas will begin as early as 5:30 a.m. and end at approximately noon. 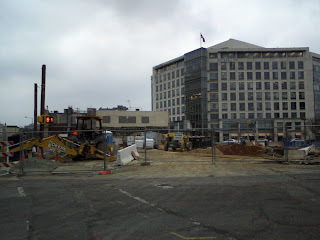 Construction continues on the Clarendon's twin chasms on Highland and Clarendon Blvd. Two cranes hover over what will be Clarendon Center in a few years. The underground parking garage is being built on the south side of the project, while serious work hasn't really begun behind Hard Times yet. I've noticed that in the past week Google has added much more traffic detail to its maps not only for the DC area, but for most of the largest cities in the US. Every day I check back to Google Maps another neighborhood has been added to the live traffic feed. It looked like Dupont Circle was the first non-highway region inside of DC to be tracked for traffic. In terms of Clarendon, now Route 50 and Lee Highway have live traffic feeds! Hoping they add Washington Blvd next. I found out about the proposed changes to local street parking in Clarendon. Apparently Arlington Country wants to extend the parking meter times from 6pm until 10pm. Also rates would go up in another garage, not sure which. There is a paper version of the petition against the changes floating around Whitlows, but would like it if anyone could point me in the direction of an online version. Whitlow's offers a popular brunch buffet Sundays from 10am to 3pm. The omelet with everything in it is the most recommended and popular choice. At $15 it seems a little steep, but it is all you can eat and you can stay for the lunch buffet. The lunch menu offers crablegs! 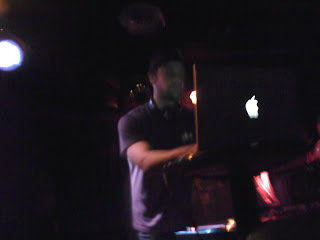 Nacey and Steve Love were spinning old school hip hop tunes at DC9 tonight. Not terribly crowded, but enough people to make it worthwhile. If you have been wanting another opportunity dance to "Fresh Prince" and "Baby Got Back", this was the night for you. Unfortunately for the DJs the power cord for their equipment was inadequately placed in a spot were dancers behind them could knock it out. Twice the beats went dead as the electric got cut from the turntable. Next time I'm bringing my own duct tape. Green River Ordinance performed an awesome rock/pop show at Jammin' Java tonight according to Stiletto. Melodime peformed after them but couldn't compare. Located in Vienna, it is a local jem that I really need to frequent more. Stiletto praises the venue as "always cheap to get in... the beer is cheap... and they have food... AND coffee after the concert. It's a one stop shop." Green River Ordinance is scheduled to play at SXSW in a few weeks! I'm embarrassed that this is the first time I've made it out the Eastern Market on a weekend. Today was a beautiful day and perfect for browsing the farmer's market, arts and crafts fair, and flea market. Its a great time for all ages and pets, and the great weather brought lots of shoppers to the fair. My favorite shop was the Map Man Jim Tam's shop of antique maps, pictures and book covers. 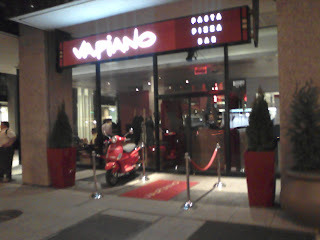 Vapiano on M Street was surprisingly packed tonight, and with the onslaught of summer weather opened up the outdoor seating. The Science Club across the street was much less occupied inside, because everyone was competing for a space on the outside lounge area. I could really get used to this beautiful weather, it does a good job of putting everyone in a good mood. 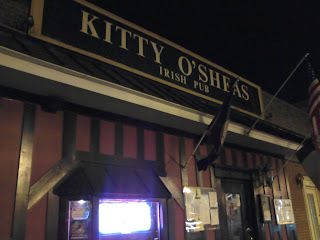 Thursdays are half priced burger night at Kitty O'Shea's in Courthouse. Billed as the "best burger in town", the small Irish pub does not disappoint. The wait staff aren't too friendly, but this is a bar that doesn't pretend to be anything more than a quaint hole in the wall. My new goal is to eat a half price meal every day for one week in Clarendon, and it looks like Thursdays will be here. Northbound lanes of Glebe Rd are closed at the Arlington Blvd overpass to allow for inspection of the overpass structure. Arlington Blvd is open at this time. Traffic delays are expected. Lucky Bar was surprisingly packed for a cold Tuesday night. Immediately south of Lucky is a great sushi lounge named Current. 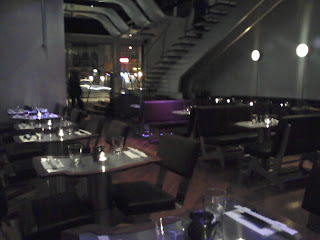 Current boasts both a trendy atmosphere and an exquisite sushi selection. I'm not a big fan of the raw stuff, but others have told me this is the best sushi joint in the city. The decor was modern and impressive, and a projector displaying movies of dolphins swimming in the ocean on the wall kept the "current" theme lively. I didn't get the chance to explore the upstairs dining hall. The red snapper is highly recommended for any sushi lover! According to DC Dept of Transportation, a snow emergency has been declared in effect since 4pm today. Expected to get 4 - 8 inches of the treacherous white stuff by tomorrow. Not looking forward to the commute, if everything isn't canceled or delayed that is. Update: the DCist is calling for THUNDERSNOW tonight. Hrrm. DDOT reports the Snow Emergency for the District has been lifted.